Before the season started, I was tabbing Chris Kreider as the next captain and the player who was going to need to take a big step forward on and off (note: leadership) the ice for the Rangers to be successful. Kreider is one of the Rangers longest tenured forwards (him and Fast, I believe) and has a very unique skill set that is difficult to defend. If it all came together, he would be near unstoppable. So far, Kreider has been that player the Rangers so desperately needed. Through 14 games, Kreider has a line of 6-3-9, which puts him on pace for a career high in goals (on pace for 35) and close to his career high in points (53). He leads the team in goals, and is top-five in points. There are some minor signs that Kreider is riding a hot streak, such as his SH% at 15.8% (career average is 13%) and his GF% being higher than his xGF% –which signifies a slow down will come– but these are minor blips, as the numbers aren’t too far off. Kreider’s impact goes beyond his individual stats. He’s been a driving force on offense, and most teammates have actually thrived when on the ice with him. There are two areas of focus on this chart, the first is the bright blue boxes –or what I see as bright blue, I’m color blind, so bear with me here– which represent Kreider’s performance when he’s not on the ice with specific players. For the most part, Kreider is on the “good” side of that middle line, meaning he’s doing a good job of limiting shot attempts on the ice. The Rangers don’t generate many shot attempts for right now, so he’s a little on the “dull” side as well. The second piece is the purple (? ), which shows a player’s improvement when he’s on the ice with Kreider. There are some outliers here –McQuaid, Zuccarello, Howden– but for the most part a player has his performance positively impacted when on the ice with Kreider. This shows us that Kreider isn’t just collecting pretty numbers, he’s having a positive impact on his teammates as well. 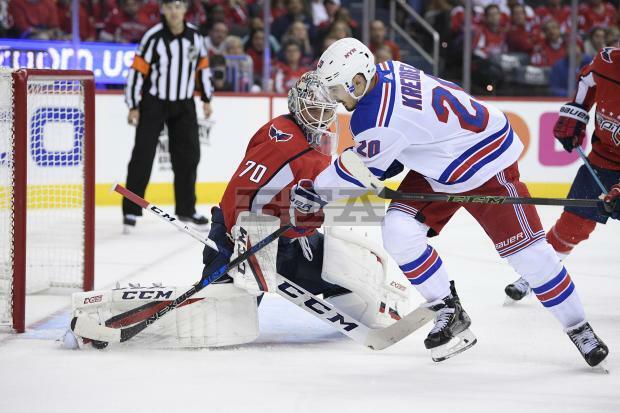 It’s still early, but Kreider appears to be taking that next step that the Rangers so desperately needed from him. Folks were wondering when he’d get to 30 goals, and this might be the year. He’s doing this while holding on to the ‘A’ and having a major positive influence on his teammates. There isn’t much more you can ask from the winger. "Chris Kreider has been great to start the year", 5 out of 5 based on 14 ratings. Anyone know what happened to Kratsvov he did not play the last game is he hurt? Probably was called away for the U20 team as IIHF break is this week. would bench him he did have 2 pts in the last game he played. 11 on the season now. He’s playing in Russia for the 4 Nations Tourney for Russia U20, a WJC tune up. Run that with Fasth as the subject. Let Kreider shoot more on the power play and use Hayes in front of the goal. Zeb can stay on the left side with Kreids on the right. Then we might see more goals on the power play and from Kreider! I been saying it for a min now, Hayes should be used in the lower slot area, he can deflect them without a doubt. There’s more than enough examples of how good is hand eye is. I think he would be better as a bump man on the PP but no way can you count on Kreids shot from that far out or his playmaking ability. Krieder always gets hot and cold. Rest assured he will have a 10 game pointless streak sometime this year. Let’s ride him while he is hot. Awesome article, Dave! great content, and more so, a great laugh! Something I think we could all use about now. Make sure you do what you have to do tomorrow people, it’s important ! Go USA!